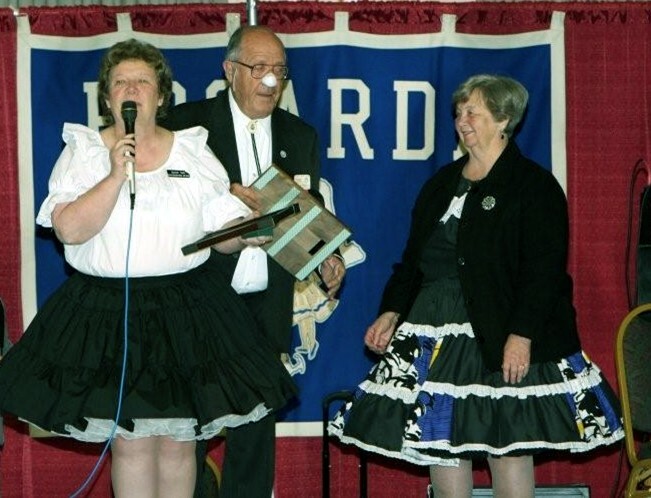 Sandi has been involved in New England square and round dancing for more than three decades. She has been a dancer, teacher, founder and leader of dance clubs and an active participant and leader of many organizations. These include local area associations, the New England Council of Round Dance Teachers Associations (NECORTA), ROUNDALAB and the Single Square Dancers USA. In all of these she has been an active contributor and has held one or more offices in several of them. In addition to her work for clubs and organizations she has served in many capacities for several New England Square and Round Dance Conventions. Sandi was in charge of the Showcase of Rounds at the Convention in Manchester, NH and use it effectively to promote round dancing and the following convention. She was Vice Chair of the 44th and 45th Conventions. On the national scene Sandi has cued at the National Square Dance Convention and served as clinician at ROUNDALAB conventions. During her tenure as a director of NECORTA Sandi was instrumental in setting up a New Dancer Ball, held in Needham, MA. This event brought leaders from throughout the region to provide a high level of teaching skill to the benefit of new dancers. The success of the Ball lead to the establishment of similar events by local associations helping to provide quality instruction for new dancers. Sandi managed to accomplish all of this while also holding a full-time job and providing a supportive home for her son, her parents and her grandmother. She is an outstanding example of the values that this award was created to recognize. The Yankee Clipper Award Committee is pleased to recognize this long history of service with the presentation of the 2009 Yankee Clipper Award.